Cancer is a complex multiscale disease involving inter-related processes across a wide range of temporal and spatial scales. 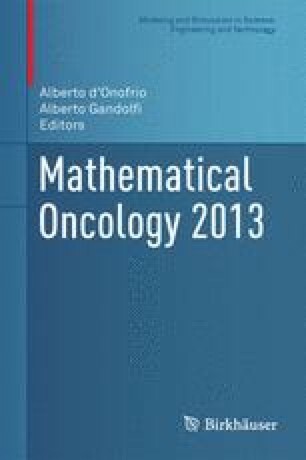 Multiscale mathematical models can help in studying cancer progression and serve as an in silico test base for comparing and optimizing various multi-modality anticancer treatment protocols. Here, we discuss one such hybrid multiscale approach, interlinking individual cell behavior with the macroscopic tissue scale. Using this technique, we study the spatio-temporal dynamics of individual cells and their interactions with the tumor microenvironment. At the intracellular level, the internal cell-cycle mechanism is modelled using a system of coupled ordinary differential equations, which determine cellular growth dynamics for each individual cell. The evolution of these individual cancer cells are modelled using a cellular automaton approach. Moreover, we have also incorporated the effects of oxygen distribution into this multiscale model as it has been shown to affect the internal cell-cycle dynamics of the cancer cells. The hybrid multiscale model is then used to study the effects of cell-cycle-specific chemotherapeutic drugs, alone and in combination with radiotherapy, with a long-term goal of predicting an optimal multimodality treatment plan for individual patients. The authors gratefully acknowledge the support of the ERC Advanced Investigator Grant 227619, M5CGS - From Mutations to Metastases: Multiscale Mathematical Modelling of Cancer Growth and Spread.